Some say everything is made of atoms, but this is far from true. Light, radio, and other radiations aren’t made of atoms. Protons, neutrons, and electrons aren’t made of atoms, although atoms are made of them. Most importantly, 95% of the universe’s energy comes in the form of dark matter and dark energy, and these aren’t made of atoms. The central message of our most fundamental physical theory, namely quantum physics, is that everything is made of quantized fields. To see what this means, we need to understand two things: fields, and quantization. Everybody should play with magnets. Michael Faraday, in the mid-19th century, was impressed with the way magnets reach out across “mere space,” as he put it, to pull on iron objects and push or pull on other magnets. He conceived the modern field idea. His view, still held by scientists, was that a magnet alters the very nature of the space around the magnet. We call this alteration a “magnetic field.” You have probably also noticed electric fields, for instance in the clinging behavior of cloth being removed from a clothes dryer. Faraday and others learned that electric and magnetic fields are aspects of a single “electromagnetic (EM) field,” that all EM fields arise from “electrically charged” matter such as electrons, and that shaking an electrically charged object back-and-forth sends waves of EM field outward in all directions through space. Examples of such EM waves include light waves and radio waves. Fields are physically real. Suppose, for example, you send a radio wave from Earth to Mars. On Mars, this wave shakes electrons in a radio receiver. Such shaking requires energy, and implies the radio wave has energy—energy that must have been carried to Mars by the EM field. So fields contain energy and for most physicists, energy is definitely something real. In 1923, Louis de Broglie proposed the germ of an idea that became the quantum revolution’s key notion: perhaps not only EM radiation, but also matter (stuff that has mass and moves slower than light) such as protons, neutrons, and electrons is also a quantized field. This seems odd: how can these presumed “particles” be fields? Here’s how. As we saw in a previous blog, when electrons pass through a double-slit experiment, the results imply that each electron comes through both slits, implying it is a spatially extended object, and it then “collapses” to atomic dimensions upon impacting a viewing screen. Quantum physics was invented during the 1920s to make sense of such phenomena. Electrons, as well as protons, neutrons, atoms, and molecules, are not particles. Electrons are spatially extended bundles of field energy, quite similar to photons, but photons are bundles of EM field energy while electrons are energy bundles of a new kind of field, a quantized material field called the “electron-positron field” (e-p field). 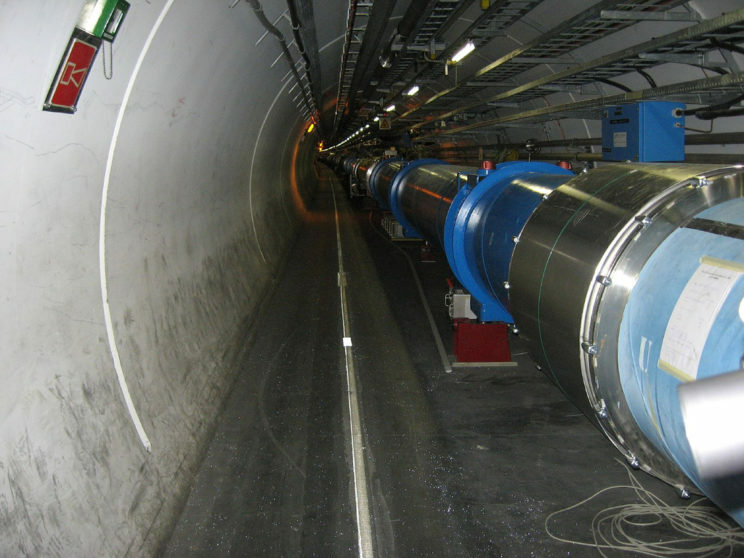 The world’s most powerful particle collider, used to discover the Higgs boson. “Large Hadron Collider dipole magnets” by alpinethread – Flickr. CC BY-SA 2.0 via Wikimedia Commons. Moving to a larger perspective, the central notion of quantum physics is that the universe is made of about 20 fundamental types of “quantized fields,” all of them similar to the EM and e-p fields. Each fills the entire universe, and each is packaged into “quanta”: highly unified spatially extended bundles of field energy. The EM field and e-p field are examples. The former has quanta called “photons” that are massless and move at light speed, while the latter has quanta called “electrons” and “positrons” that have mass and move slower than light speed. There are also six types of quark fields, three kinds of neutrino fields, two other kinds of electron-like fields, and other fundamental fields including the recently-discovered Higgs field whose quantum is the Higgs boson. It’s thought that a “theory of everything” will eventually emerge that will unite all these fields in a single unified quantum field theory analogously to the way the EM field unites the electric and magnetic fields. Dark matter is probably a quantized field whose quanta have not yet been discovered because they don’t emit or interact with light or with most normal matter. Dark energy is even more mysterious and might be an expression of the quantum vacuum (see below). How do atoms and molecules fit into this picture? These are composite quanta, made of proton and neutron fields (which are themselves made of quark fields) and e-p fields. Atoms and molecules are highly “entangled” objects, causing them to act in many ways like single quanta. An important new principle arises when we ask the simple question: what happens when we remove all the quanta from some region of space? Will that region simply be empty of all fields? The answer is that it cannot be empty. In fact, if any one of the quantum fields were entirely absent from some region, the strength of that field in that region would have to be zero. But this value, zero, is precise and has no uncertainty, so it violates a core quantum principle called the “uncertainty principle.” Thus all quantum fields must have a minimum or “vacuum” value even when there are no quanta at all. The quantum vacuum field must be present everywhere in the universe. In fact, photons and other quanta are best visualized as disturbances, or waves, in this universal vacuum field. A region of space that lacked even the primeval vacuum field would have to vanish altogether. Empty space simply cannot exist. This is perhaps the closest physics can come to explaining why there is something rather than nothing. Featured image credit: Particles by geralt. CC0 Public domain via Pixabay. Art Hobson has degrees in music and physics and was a professor of physics at the University of Arkansas in Fayetteville for 35 years prior to his retirement in 1999. He then found that he had time to pursue a project he had long pondered: to understand how quantum physics works. Following the successful 2013 publication in the American Journal of Physics of a paper titled "There are no particles, there are only fields," he decided to write a book explaining quantum foundations for the general public as well as scientists. At 82, he still loves to ride his bicycle to his ivory tower on the campus every day. 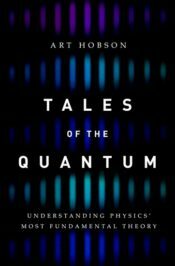 He is the author of Tales of the Quantum: Understanding Physics' Most Fundamental Theory (OUP, 2017). Thank you for putting this in such a clear way for a complete science beginner. I feel I can discuss some of these exciting ideas with my 7 year old grandson when he asks questions. Brilliant article! This is why science needs more than just researchers. To bring this to the people is just as important as the research itself. Well done! Great article, thank you for posting. As someone taught classical physics first and catching up with Quantum it can be hard to fill the gaps. Your approach gives a framework for starting from scratch.